It is never too early to start planning your holiday menu! Although I love family traditions, it is fun to shake things up and leave room to try new things. For example, Almond Fresh Noel Nog! Noel Nog is a NEW dairy-free and egg-free holiday nog. It is also a fortified almond beverage. And a 250ml glass is only 100 calories! But how do almond beverages taste? 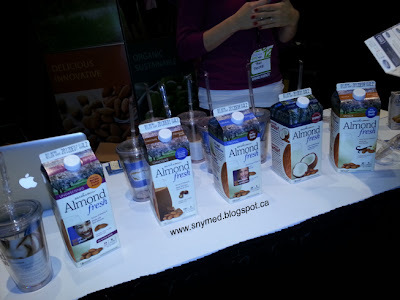 Well, I can answer this question, as I had the opportunity to try Earth's Own Almond Fresh beverages at the recent She's Connected conference in Toronto! I was able to pick between the Unsweetened, Chocolate, Coconut and Vanilla Almond Fresh flavours. Always the chocolate lover, I tried chocolate and found it quite tasty! The best comparison I can make is that it tasted very similar to chocolate milk, but with a nuttier, less creamy texture. I would definitely drink this on a regular basis. 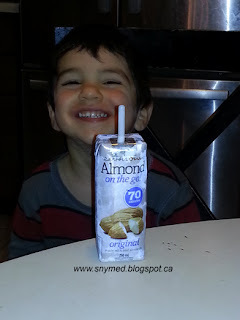 But I put Almond Fresh to the ultimate test when I had my little critic try "Almond on the Go", Original flavour, their product in a drinking box. My son and his siblings really loved the beverage, and kept referring to it as "milk". So, the flavour seems to also appeal to kids. He Loved the Almond on the Go Drink! Looking at the ingredient list, I was pleased to see that a 250g glass of Almond on the Go Original, was only 70 calories. And I was impressed that that same serving also yielded 50% of the daily requirement of Vitamin B12--AND 45% of the daily requirement of Vitamin D. Vitamin B12 plays an important role in the functioning of brain and nervous system, whereas Vitamin D is essential for bone growth. What an easy way to get both important vitamins, just by enjoying a glass of Almond Fresh! Earth's Own Almond Original is High in Vitamins B12 & D! Have you tried Almost Fresh before? If not, what flavour would you reach for to try first? Would you be interested in trying Noel Nog this holiday season? I think I will give the chocolate a try! You won't be disappointed! It's delicious. You will not be disappointed! It's delicious! Looks delicious. I've never tried an almond beverage before but I love the taste of almonds so I'm sure I'd like it! Great post! I absolutely LOVE Almond Fresh! Great chatting with them at SCCTO! I love Almond Fresh, it's delicious and this Egg Nog flavour sounds yummy, I will have to look for it in stores! Your son is so cute! I am going to buy the Egg Nog flavour for my husband! LOVE the chocolate Almond Fresh! 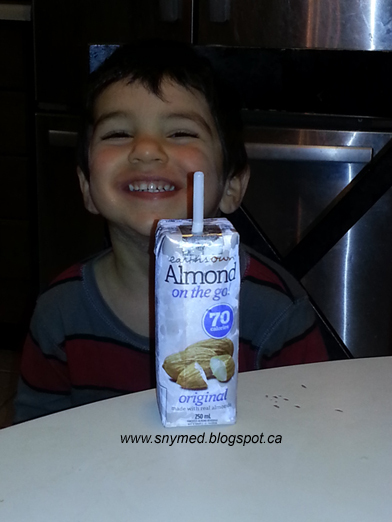 And I also love the idea of this Noel Nog :) Your son sure looks happy to be drinking it ;) Thanks for sharing! Brandi, my boys are such happy eaters! I missed visiting this booth, it was such a busy two days!